If you have a Promo Code you must create an account/login and apply it before adding items to your basket. Promo Codes are not applied to All-Over-Print products. NEW! Tees, shoes, bags and more! Pick a design, add a tee! Can only be purchased on their own. One per transaction. Please create an account or login before buying eVouchers, thank you. Note: These are (e)lectronic Vouchers that can only be activated and redeemed online via a special link. The activation link will be available in your Customer Account when you login from a PC or Laptop. eVouchers cannot be used to pay any Postage & Packaging costs. © 2017 - 2019 Broken Heart Tees - 11 Hutley Drive, Colchester, CO4 5FU, United Kingdom. Custom orders will be on hold unitl February 5th 2019. USE MTH10 for a 10% Discount! You will receive a 10% Discount on your first order! Simply create an account and shop! Please login/create account to buy. Please login/create account to Checkout. All fields required. Email will be your username. If you have a code please enter it after creating your account and before adding items to your basket. Our "Charitees" pages enable charities/good causes to raise funds via specialised tees. Why not choose a cause to support next time you shop with us! 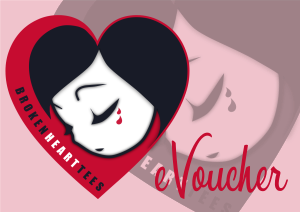 Choosing No thanks results in a donation being made to the Broken Heart Tees Foundation fund. At the end of each trading year we share the fund between the active good causes/charities that have partnered with us.